I randomly clicked on the link to my blog yesterday to check a book title and noticed a little trophy in my notifications. The trophy was for my blog’s anniversary, which is June 18, 2010. This little blog has been somewhat functional for four years now. Of course I knew that seeing the trophy, as well as being on the blog so close to the anniversary itself was a sign, so I went back and read my first ever blog post, which you can read here. The irony is that in June 18, 2010, the Wizarding World of Harry Potter Hogsmeade in Orlando was celebrating it’s grand opening, and on June 18, 2014 and for many months before that date, I have been a part of the Wizarding World of Harry Potter’s Diagon Alley Opening Team. My blog post from four years ago was talking about new beginnings. I was just beginning community college, had no idea what was in store for me but I knew everything was about to change. However I was under the naive guise and delusion that once I started school I would find a semblance of normalcy, consistency, and routine like the one I had grown accustom to in high school. This was never the case. The past four years, individually, have been so unique and critical to my development as a human, as a thinker, as a worker, and impacted every aspect of my life. My first year of college I tried the party scene and quickly realized that picking up my passed out, puking friends off the ground was not what I considered fun. I fell in and out of love and experienced my grandmother dying in my second year of college. My third year I graduated from my community college and began going to a local University, where I made no friends, only good grades. That same year we put my dog Lady to sleep and in September 2013 I dropped out of college and went on medical leave. In November I got a part time job at Target to cover my medical bills and in January I was let go from the seasonal position. I found out Universal Studios was hiring the same day I was let go and I applied online. Working in the Wizarding World of Harry Potter had been on my bucket list since the park opened. I didn’t care if I was 90 years old or 19, I wanted to work in the park before I died, and in February 2014 I got my wish. I began working in Hogsmeade and did my rounds in Filch’s Emporium of Confiscated Goods, Honeydukes, and Dervish and Banges. Since I started at Universal I have worked in over 10 different merchandise locations and made numerous friends. I currently work in Weasley’s Wizard Wheezes and Quality Quidditch Supplies in Diagon Alley, which opens July 8, 2014. If you had told me four years ago that I would be doing Crossfit at least 3 times a week, working part time in The Wizarding World of Harry Potter Diagon Alley, and that I’d be going back to school in the Fall with one of my new and best friends from work, I would’ve laughed in your face. My blog is reflective of these four years. When I was lonely, depressed, and looking for an escape I would escape into books, dive headfirst into blogging, and gained alot of ground in the community. When school got too hectic, when I got sick, and when I started working my blog suffered and I became obsolete. I’ve learned something about myself recently and refer to it fondly. I don’t know how to adult. I was never really taught to adult, never picked up on my parents cues for keeping their lives in check, organized, and running, and now I’m floundering. Or I should say I was. Yes I can keep a steady job and keep myself healthy by going to crossfit, but I haven’t learned how to balance everything else. So I got to thinking. Bodybuilders use leg day, arm day, and back day at the gym to keep themselves on track and to not overexert the same muscles two days in a row. What if I applied that to my life? I thought of the things I was lacking my life and wanted to get back and my list looked something like this: tv shows, reading, writing, and cleaning. Of course I expanded on those individual concepts and tv shows became youtube, movies, dvd’s, series, netflix. Reading became fanfiction, novels, magazines, fiction. Writing became blogging, journaling, fiction, short stories. And cleaning became laundry, dishes, bathroom, bedroom, etc. Now unlike bodybuilders this model is not set in stone. If I absolutely need to do laundry on my reading day, well then shoot I’ll manage to do both. I’ve set up this system on my cork board above my desk in my room in a way that I can maneuver the set days and switch the tasks. If after a month or so of this routine it gets monotonous, I can switch it up, add new activities, etc. The goal is that this new system will get me back to doing what I love, in addition to doing what I must in terms of work, crossfit and school (not that I don’t love those things too). If anyone has actually read the entirety of this post I commend you, seriously. Thank you for taking the time out of your day to listen to me talk about my life. Maybe you got something out of it whether it was entertainment or wisdom. I don’t claim to have any or all of the answers, but I have learned a few things over the years and have been exposed to my weaknesses. 2014 so far has been one of the most exciting years of my life and it’s half way over. I’ll be 22 years old in less than two weeks and I’m honestly excited for my future. 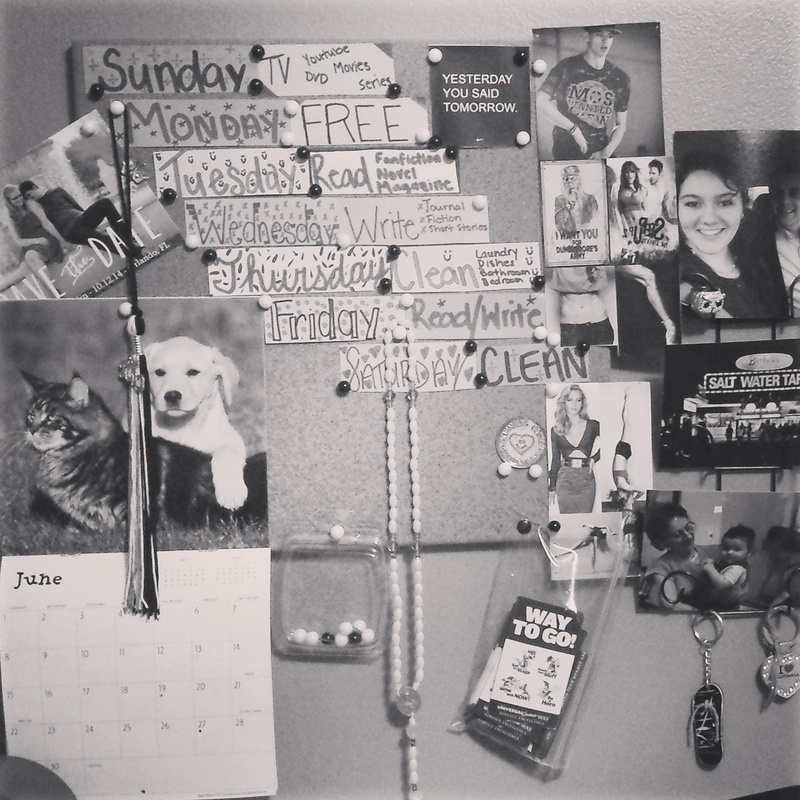 My life displayed on a cork board.